Eric J. Gates, the award winning author of fast-paced Suspense Thrillers has kept his streak alive. The first book in The CULL series, "Bloodline" is currently a Goodreads Book of the Month and received an Honorable Mention Award 2018 from Readers' Favorite. Look for the release of "Bloodline" in audiobook soon. ​A Spanish language edition of the multiple Award-winning 'Outsourced' (called 'Enigma Asesino') has also been released. See Amazon Author pages in the UK and USA for more information. 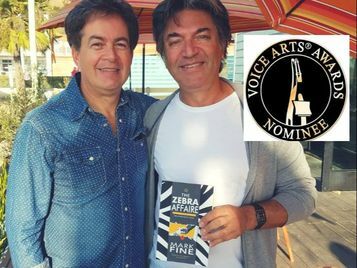 The audiobook for a story set in South Africa – ‘The Zebra Affaire’ – has been nominated for a prestigious Voice Arts Award, which is the equivalent of the voice over and narration industries’ Grammy Awards. The story is written by Californian-based South African expat Mark Fine from Johannesburg, and read by Capetonian and fellow SA expat Dennis Kleinman (who lives just an hour away in LA). ‘The Zebra Affaire’ – which features a love affair between a white woman and black man during the Apartheid era in SA – has the voices of all its characters read superbly by Kleinman… earning the book a Best Voiceover nomination in the ‘Audiobook Narration – Fiction’ category. The Awards will be held on 18 November 2018 on the Warner Bros with 'Avatar' and 'Aliens' actress Sigourney Weaver hosting. #HoldingThumbs!